Here are 5 characters every kid must meet!!! I know you can't teach and old dog new tricks, but kids will still love the tricks this old dog already knows. In case anyone hasn't heard of Clifford (if there any of you out there) he's a giant red dog. He bathes in the swimming pool. He chases and sometimes catches cars. Kids can use his tail as a slide. Kids love him. What child doesn't want to ride their dog to school or have a huge fuzzy friend watching out for them? What more do I really need to say? Oh, I love him too! In his books we always learn that big or small, true friends stick together and love is what matters in the end. Did you know that Clifford started out as a tiny pup but he grew so big because Emily Elizabeth loved him so much? That makes a mommy heart melt doesn't it? This bird knows what he wants and kids loving seeing him try to get it. The pigeon books are like a throw back to the comics I used to love to read in the Sunday paper as a kid; simple yet expressive illustrations combined with silly and straight forward word bubbles. My little ones and I love to read these books in funny voices. What does a mad pigeon sound like to you? In our house it sound like a lot of laughs. Oh, I have loved them forever and I've got my daughter hooked too. Like Clifford, they are classic characters. Their stories of friendship and helping each other are endearing to kids and parents alike. And though they've been around forever, I'd say they put Dora and Boots to shame! (Yes, we love Dora around here, but Frog and Toad's friendship just has something extra there which I love reading about.) My all time favorite story is "Cookies." My daughter learned about will power at an early age when I was cracking up at the end of this one. As I said above, these books may be flashbacks of the author's childhood. Who knows? David is a mischievous little guy who sends most of the books getting reprimanded, but is always loved in the end. I did have friend tell me once that she wouldn't read these books to her son because the illustrations didn't appear to her. To her I must respond, well I think they are meant to appeal to children, which they do! Very much! In fact, it looks like a child drew the pictures and wrote the words. Seems to be working well, at least we like them in this house. Ahhh, Splat. He's such a sweet little cat. Timid, lovable, and very relate-able for kids. The illustrations in these books are awesome! I could look at drawings of Splat's silliness all day long, and the stories are sweet too. One note I must point out, Splat seems to have become wildly popular, rightfully so, and was apparently picked up by the 'easy reader' people. More on them later, but for now let me just say they more often than not have a way of turning wonderfully written characters into assembly line style story books. So, if you want the really good stuff, look for Splat books written by Rob Scotton, not the ones labeled "based on the creation of Rob Scotton." The illustrations are still good, the text just isn't the same. Okay, happy reading! I hope your kids enjoy meeting these new friends! # 1- Clifford really is a wonderful character... a side note on that- as a child I ordered a clifford book from Scholastic, it was in spanish (I didn't know when I ordered it). My dad is a 'silly' reader (more on him some other time) but he would drive me crazy reading that book... that is good memories, wish I still had that copy. #2 Mo Willems is a literary Genius... I LOVE him. and I love pigeon so much! #3 AHHHHHH.... 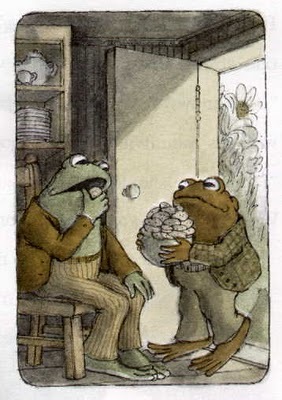 Cookies is my favorite frog and toad too!!! #4 was I that friend? cause back in the day I really didn't like the david illustrations, but now I love David... it's a combination of having boys of my own and also true to life stuff is so funny... and now I really like the illustrations... who knew. ps my kids can't get enough of these books, they pour over them after we read them together, there is definate child appeal! #5 How have I never heard of Splat??? Guess it's time to go visit amazon! 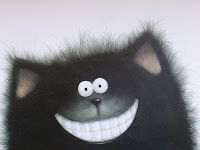 Look the blog is working already, I am introducing you and yours to the wonderful world of Splat!!! I recommend the original Splat the Cat to start (he is starting school in this book FYI) but my kids are really stuck on the Halloween one right now for some reason. Oh, and no it wasn't you about David.